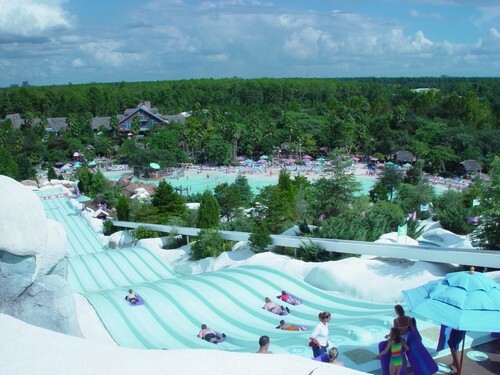 Water Parks In Orlando – With a great climate and the world’s largest collection of theme parks, Orlando is often called the ‘world capital of fun’ and is a great base for a family holiday. The incredible array of parks includes the incomparable Walt Disney World Resort, SeaWorld Orlando and the Universal Orlando Resort. Within these complexes and close by are four wonderful Orlando water parks, the ideal place to have a ‘splashing time’! While water parks are aimed towards kids, adults for sure have a fun time – we get a chance to act like kids again, let our hair down and scare ourselves in water slides. 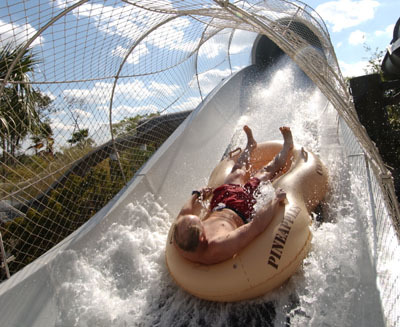 There are four main water parks in Orlando, and which one you choose depends on what you’re looking for. This is one of the best water parks to go if you have young kids. 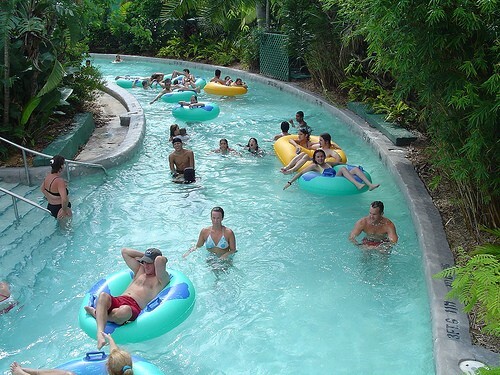 It has two side-by-side wave pools, and a lazy river ride. It has a lot of “medium” rides, so it is something for those who like a bit of Adrenalin, but you won’t find any extreme rides here. This park is famous for having one of the world’s fastest and tallest free-falling water slides and other Adrenalin-pumping attractions. It is also very popular, so make sure you are there early. This park is part of the Disney World family. Here you get the chance to swim with real sharks, plus a lazy river ride and three different waterfall raft rides. They also have an awesome wave pool, which with its 6 foot waves is definitely one of the best wave pools of all the water parks in Orlando. This park offers something for everyone from daredevils to scaredy cats. Thrill rides include: Brain Wash, Der Stuka, Mach 5, The Bomb Bay and Wake Zone; more timid types will enjoy the gentle waves in the Surf Lagoon. In all, this park is for those looking for a real adrenaline kick, as there are many extreme rides to find here. If you want to combine water parks in Orlando with Disney magic and have a fortnight’s holiday then it is recommended that you consider getting a 14-day Disney Ultimate Ticket. Magic Kingdom, Epcot, Hollywood Studios and Animal Kingdom, plus Blizzard Beach and Typhoon Lagoon, and much more. That way you can mix wild, wet fun with other kinds of activities, but it’s not suitable for those with less time. What to Do in Orlando, Florida is a great place to visit for a vacation. When you think of Orlando, most people only think of Disney World, and while this is a great way to spend your time, it’s not the only thing to do. Orlando is filled with plenty of fun places and attractions, so it’s a good idea to open up your mind and take it all in. If you are planning a trip to Florida, here are a few things you should do while in Orlando. Obviously, you know that it’s here, so you may as well take a day or two to check it out. There are so many different things to do in Disney World, and it’s perfect for adults and families to enjoy. Spend a day in the Magic Kingdom and relive your childhood or watch your children as they are amazed by their favorite characters coming to life. Besides the Magic Kingdom, you can also enjoy Animal Kingdom, Epcot, Downtown Disney, and so much more. When staying in the Orlando area, you should visit the Westgate Lakes Resort and Spa. This hotel offers plenty of fun amenities for you to enjoy. Take in the great views, relax in the comfortable bed, or spend a day getting pampered at the spa. You will feel like a celebrity when you experience the treatment of this place. What makes it great is that you can easily spend your days taking in everything the hotel has to offer, or you can use it as a nice little pick me up after a long day of taking in all of Orlando’s other amenities. There is so much water in and around Florida that you can’t leave the area without doing something water-related. While in Orlando, spend the day enjoying an air-boat ride. These giant boats have huge fans attached to them that allow you to maneuver the waterways. There are plenty of guided tours in the area that will allow you to take in the sights and enjoy some fun experiences with your travel buddies. Want to do something different while in Orlando? Then check out the Blue Man Group. These three individuals have been entertaining audiences for years with their quirky performances, and you can take them in while in Florida. The group offers multiple time slots, so you can fit this in during the day or end your night watching one of the fun performances. Whether you’re an avid art lover or if you simply enjoy taking in the different pieces, be sure to hit up the American Art Museum while on vacation. This location has the world’s largest collection of Tiffany glass, so you can see jewelry, glass, windows and more that are worth more than $5 million. Keep in mind that this may not be the best place to bring small children, so be sure to plan this trip accordingly if you’ll have little ones in tow. Most people don’t realize how much beauty can be found in the grounds of Orlando, and the Botanical Gardens will show it all off with pride. While here, you can walk the 50-plus acres and take in the 1,000 rose bushes, butterfly garden, and citrus grove. You will certainly enjoy the beauty and tranquility that this place has to offer, and it will be a nice relaxing welcome after spending a few days in Disney World. If you like to hit the links, then Orlando is a must visit. This town is home to multiple golf courses for the newbie to the advanced. In addition, you also may run into some celebrities while golfing, as the more than 170 courses in the area are frequented by some of Hollywood’s finest. If you like to golf, make sure to pack your gear so you can enjoy a Florida golfing experience like never before. When you’re planning your trip to Orlando, make sure you have enough time to tackle all these fun activities. There is so much to do in this central Florida town that you didn’t even know, so make sure to check it out on your next visit. Orlando has become synonymous with oranges and theme parks. But there’s more to this sunny Florida outpost than candy floss, the citrus trade and mascots. With cheap flights to Orlando readily available, there’s no reason why you shouldn’t go to explore just what makes it such a fantastic holiday hotspot. Orlando is a city of lakes. Most are relatively small, but all are charming, and some of the larger lakes (Lake Eola is our favorite) are perfect for a family picnic or a romantic stroll. Seeing the city’s skyline reflected in the placid waters on a summer’s day or even a crisp autumn morning, the swan-shaped boats bobbing gently on the surface, is enough to make even the most hardened of hearts soften to sentimentalism. There are plenty of bars and cafés around for a quick bite and a good, strong coffee and the grounds, replete with Chinese pagoda, are pleasant to walk through. No, this isn’t what you think. Kelly Park in Rock Springs is just a short ride away from the city center and rather than an indoor pool where you have a limited time to share space with a dolphin, this is the real deal. The park sits in an impressive 248 acres of land, where the main attraction is to go tubing down a natural spring. The journey lasts a total of about 25 minutes, with lagoons and pools along the way. The park can get crowded in peak season, so I would suggest getting there already at 9.30 am when it opens. There’s even the option to hop on a canoe down to Wekiwa Springs, and the rest of the park is beautiful to walk through, with camping options available. For the trendy, arty side of Orlando, head to the Downtown Media Arts Center. Kitted out on the inside upstairs level like a cool independent picture house and on the outside with a wacky green Gothic-style façade, this is the place to catch cutting edge films and documentaries from the American and international scene. Tickets are relatively cheap and the venue is intimate, with only 80 seats upstairs. The cinema operates on an interactive basis during their film slam season, so check ahead to see what’s on during your visit. The Audubon Park Community Market is not your usual farmers’ market fare. With bespoke baking amongst the locally farmed, sustainable, organic food on offer, as well as live music and a general bohemian atmosphere, this is one creative market you’ll want to visit. Come to grab a drink, mingle with the locals and learn about local produce and sustainable farming. Orlando city has a history that stretches back beyond the theme park takeover. The problem is, not many people know much about it! Get informed at the Orange County Regional History Center. Located in the Orange County Courthouse, the collection here covers three floors worth of space, charting the 12,000 year history of Central Florida. From the arrival of the Spanish to indigenous flora and fauna, the exhibitions give a fascinating insight into the history of the area and its place in the world. Ah I remember Blizzard Beach. SOO much fun. Love the water parks at Disney World. When our family travels to Orlando we rarely venture outside of WDW, but I may have to try the others on your list. I loved Typhoon Lagoon. Swimming with sharks is definitely not something you’ll find at your average water park, and while I admit I was terrified initially, it was such an awesome experience to know you were swimming in the same tank as these animals. The wave pool is also much better than any other park I’ve been to (and I grew up in Tampa where Adventure Island was the water park of choice).